For the third year running, DuBois is getting a chance to see a group of young men chase their own dreams, while doing so as a collective unit. 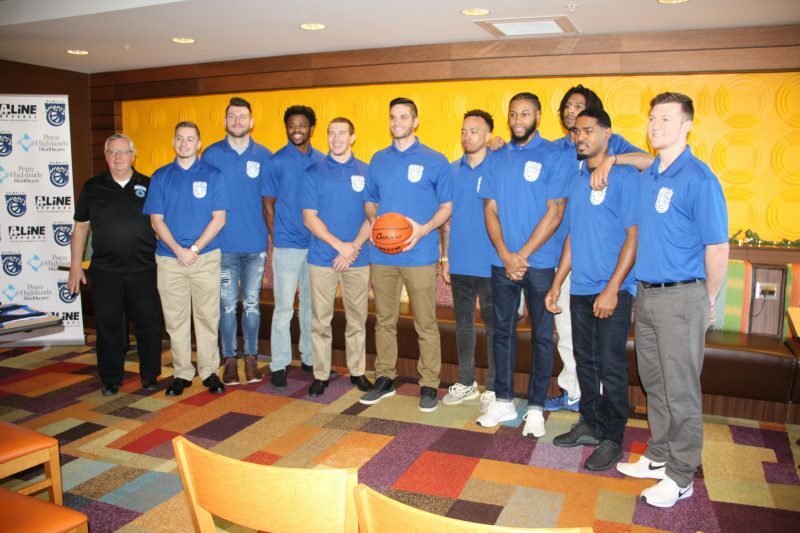 The 2019 campaign for the DuBois Dream basketball squad is a reality, and this past weekend, fans and media alike got to take a first-hand look at the new team for the North American Basketball League, complete with familiar faces, new attire, and new backing, at the Fairfield Inn and Suites. Team owner, player, and coach Albert Varacallo was all smiles as he saw his squad before him, and he already seemed ready to get to work. With a few practices in the books following training camp, the team already seemed prepared to get into action, but this year it already felt as if it was a different vibe. Third-year player DeOndre Terrell, better known as “Redd” to his teammates, felt the team was already on its way to becoming a cohesive unit, even in just a short time. 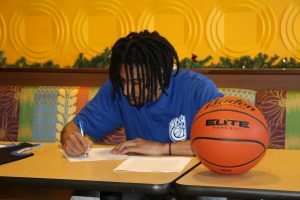 DeOndre Terrell, best known as “Redd” to teammates, signs to join the DuBois Dream for the third season. The biggest change heading into the 2019 season for the Dream is in the coaching, but in a way that is more beneficial than a re-learning experience. Last year’s head coach, Matthew Stoey, had to step aside from the team due to some other things that needed his attention. In his place, Jacob Perrin, who recently was the assistant head coach at Penn State DuBois, has come in to take on the role on an interim basis, and he seemed ready to go in his new role. Already having a lot of coaching experience, it was a bit different in his eyes coaching the Dream instead of the Lions, but at the same time fun in the process. “It was great just learning the camaraderie side of things, team chemistry side of things, and it’s a really big deal with the personalities and getting everyone to work with each other,” Perrin said. “I think we’re all on the same page. We’re always trying to win, better ourselves, and each other. Whether it’s short term, long term, or in the moment, we’re all just staying focused, working hard. “The guys have put in a lot of time, sacrifice. Right now, we’re just trying to focus on a mutual respect for each other, the game, and it takes a lot of commitment. Along with Perrin, the Dream has taken on a new look on the coaching staff so that Varacallo doesn’t have to constantly play the role of coach/owner/player. The team has trainers to focus the team on being physically ready, from cardio sessions to weight training, to having shooting coach Rick Homer focus solely on shooting and rebounding, and even having a coach regarding the mental side of the game, and how they handle themselves outside of the court. “We can focus on the guys in an individual aspect. The shooting aspect, for example, in the past, is something we haven’t focused on. In the past, we’ve been blessed with great shooters, and that helped carry us through,” Homer said. “But, we have higher expectations this year as far as shooting percentages go. So, it calls this year that we help specialize in that. A familiar face to the Dream, Rick Homer is this year’s shooting coach. He and interim head coach Jacob Perrin are looking for a higher shooting percentage from the 2019 squad. Perrin echoed the statement of being able to focus on being just a coach on the floor versus some of the fundamentals, but also made it clear there were still obstacles the team was trying to overcome. One of them, surprisingly, is just being able to get time on the court. “There’s definitely things that we as a team have to overcome. One of the things is gym time, gym availability. Right now, it’s limited. Having that morning workout, then the afternoon to do some lifting or mental training. Then when we do get that hour, or hour and 15 minute practice session, we can really focus on what we need to take care of on the court,” Perrin said. For Varacallo, it eases the stress on him to the point where it defines the roles of each person, both player and coach. People really needed to know their roles. I really like where we’re heading, because there’s a lot of good people that are a part of this,” he said. “One of the mottos this year has been dominating, but another one is “You can either have excuses, or you can have results. Many of the faces that will be on the court from a season ago have made a return this season, including Redd and last year’s Penn Highland’s Offensive MVP, Hassim Dixon, better known as “Peach” to the team. This year there is also a returning player from the inaugural 2016 team, Rue Moore. 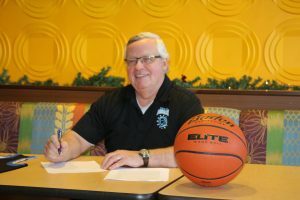 After being away from the team for a season, he was really ready to get back on the court, especially for the town itself. Although most of their season will take place beginning as spring approaches, Varacallo has made a schedule that will allow the team to get in some true game experience during the winter months, and also give the community a chance to see the team before they hit the hardwood running full steam. In the end, the biggest accomplishment for everyone on the 2019 team is to simply live a dream of playing basketball at a higher level, or being involved with basketball at a higher level. I just love this community, the game, helping people. Growing up in the area, everyone wants to lend a helping hand. I saw how much the game can have an impact beyond the court,” Varacallo said. “Once I started it, I didn’t know it would turn into this, but I knew I had to take a chance on it. I can only see it getting bigger. Perrin echoed the statement of Varacallo, but took it a step more by looking not at just accomplishing the dream that lies in front of him and the team, but the one after that. “We (have) got to move onto that next dream. We can’t move onto that next level without buying into (what we’re doing) right now. If we don’t win or give back to the community, we are just playing basketball. We are working towards something bigger,” Perrin said. For even more information on the 2019 DuBois Dream, along with their entire schedule of games, visit them on Facebook.